Blue Keld spring water is easily recognised by its distinctive narrow blue bottle. Available as a natural still water or flavoured carbonated variety, the water’s source is an Artesian Spring situated on the edge of the Yorkshire Wolds. The land around the spring in Driffield, North Yorkshire, was originally bought in the early 1990s, purchased by a local farmer, to grow potatoes. He soon discovered that the land housed the high quality spring, so built a facility for a small bottling unit. This is how Blue Keld Springs Ltd, owned by the Marr Group, was born. Through hard work and commitment the business grew, and so did the premises. Granted natural mineral water status in 1998, the demand for the product increased. This meant that Blue Keld had to find an effective way of storing large quantities of the bottles for fast and efficient distribution. In 2004, Coldwise Construction modified the bottling line, and also designed and installed a complex for producing ice. The extended facility required a drive-in racking system, as this was considered to the best use of the available space. Coldwise specified Redirack based on previous experience of the company’s reliability and excellent service. Peter Wise, Managing Director of Coldwise, explains further: “As the products being stored in the warehouse are constant, and the flow of production is continuous, a racking system that enabled stock rotation was not required. 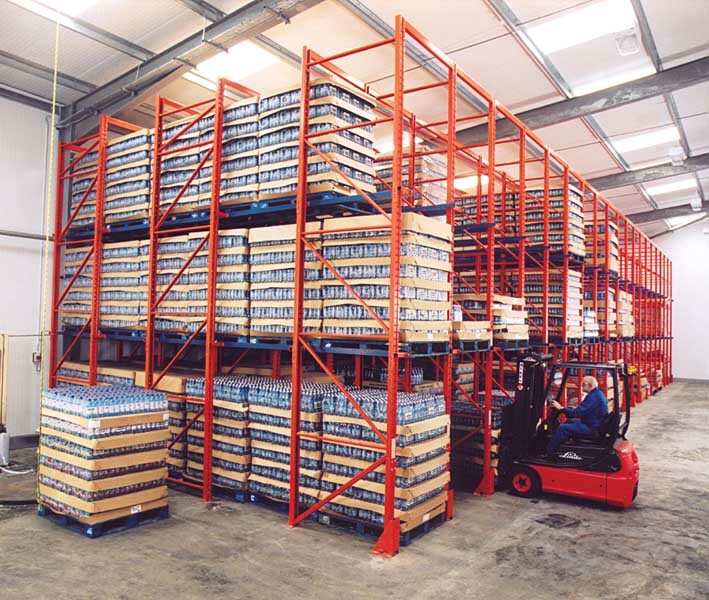 Drive-in racking ensures the products are protected, and achieves maximum space utilisation. 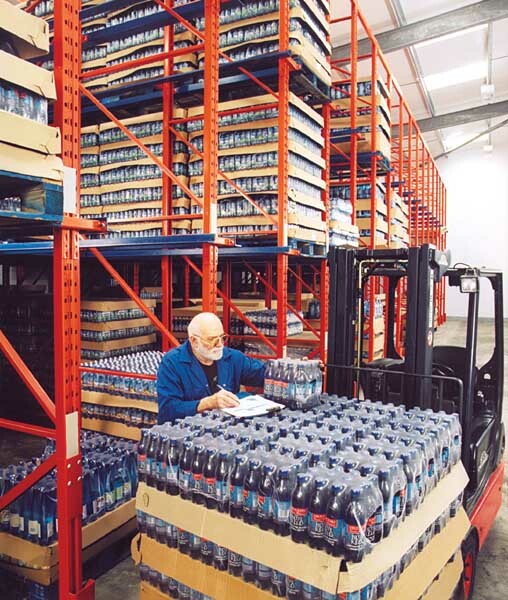 ”The bottles are stored at ambient temperatures on ‘bottle racking’, which is 6 pallets deep and 20 lanes long. Each pallet measures 1200mm deep by 1000mm wide, and can store 500-1000 bottles, depending on the size of the product. To produce the ice, natural water is piped into the building direct from boreholes at the underground spring. Following a purification process, the ice is produced on 136 ice-making units, on an elevated platform. These are then stored in large isolated bunkers, and raked onto a conveyor system. From here the ice is packaged, placed on pallets at a temperature of –280C, and stored on ‘coldstore racking’, which is 7 pallets deep and 17 lanes long. The Blue Keld products are then distributed to the 4,000 outlets that sell the water and ice, including supermarket chains, schools, hospitals, and bars. Blue Keld also supplies its products to wholesalers and distributors, where they are exported all over the world including Sweden, Egypt, France, Hong Kong, the USA and most recently, the Middle-East. 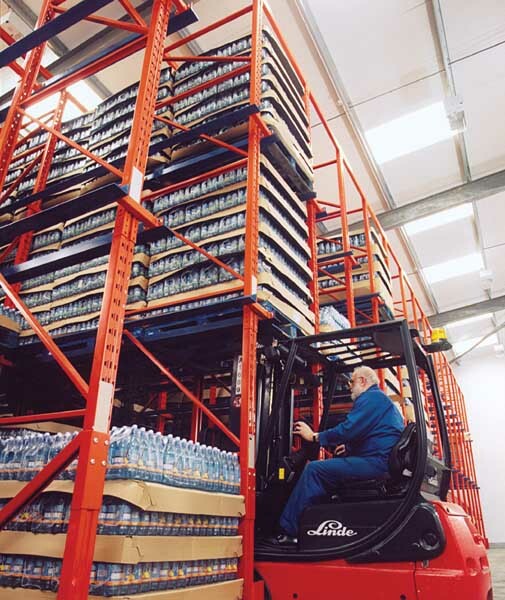 Blue Keld’s highly efficient distribution centre complete with new racking system, means the company has the capability to service customers both large and small in the UK and worldwide. 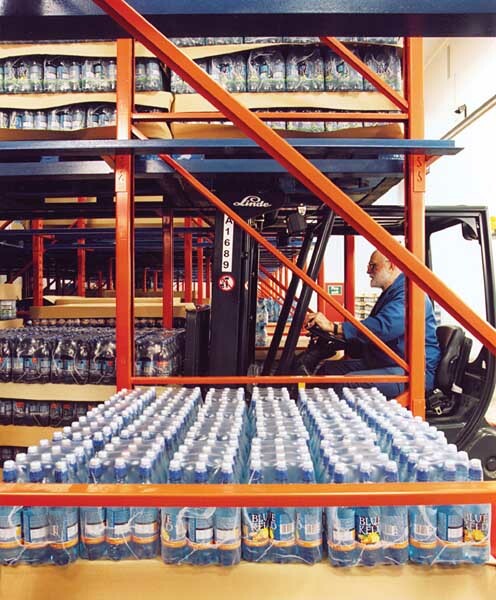 Through reputation, development, and with a little help from Redirack, Blue Keld maintains a strong position for premium quality mineral water.